Regardless of what plumbing problems you may have, rest assured that they will be taken cared of by our experienced plumbers. It is best to get the services of a professional plumber who is trained, knowledgeable, skillful and technical at work. Aside from this, you can find one near you, who is honest and friendly. You will be sure that your sewer problem or clogged drain will be fixed at a reasonable price. All our job estimates are free of charge, and we provide instant over the phone pricing. 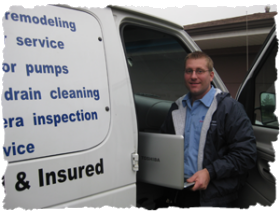 When you are within the Northwest Chicagoland and subsurbs area looking for professional, competent and cost-efficient plumbing service, please give Nick a call at 1-847-754-8299. (we are local – Streamwood, Illinois). Friendly, honest and experienced. 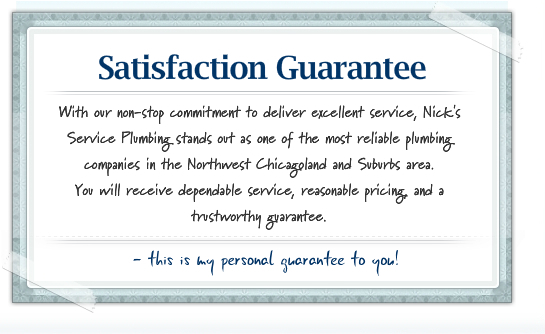 Talk to Nick now for a no-obligation plumbing consultation and instant over-the-phone pricing. If you love our site and/or enjoy our services, vote for us by clicking on the +1 folder. Thank you. After repairing Kim and Tom's sewer pipe. 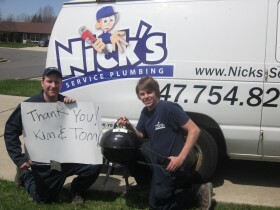 They were so happy with Nick's Service Plumbing Inc. and surprised Nick and his team with a truck grill along with the utensils! We want to THANK YOU! for the gift and for giving us the opportunity to service you! !